Odoo ERP is a single software that covers all the requirements. It also helps to improve the quality and the efficiency of the business. When there is a change in the functioning of the company, Odoo ERP helps to adopt the changes and provide flexibility. Another highly useful feature is that, data security is present. The Odoo v13 is expected to get released during the Odoo experience to be held in October 2019. 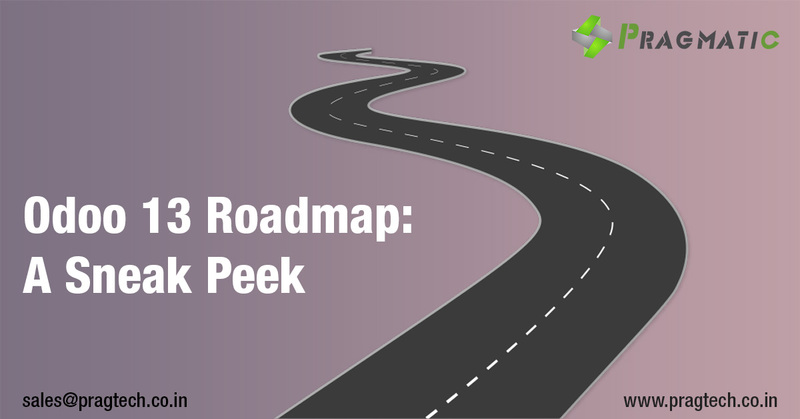 Before that, we are providing you sneak peek into the roadmap for Odoo v13. Since Pragmatic was present at the Odoo Experience held in Belgium last year, we have compiled this blog on the basis of Odoo 13 road map session presented there. With this, users will be able to purchase services directly from your Odoo database. This will be the highlight of Odoo 12 and that’s what Odoo calls in-app purchase. This new feature of Odoo 13 will help you save a lot of time because the user will be able to integrate Odoo 13 with third-party vendors and directly share the information with them. You will also save time because the payments would directly be made from Odoo. In Odoo 13, so we can expect a lot more services in the coming version like Odoo Bank, where the user can lend some money from Odoo. Now, let us look at the Odoo Bank. With Odoo bank in Odoo 13, the long process of applying for a loan and then waiting for the bank to lend the money gets shortened and businesses would be able to get cash on an immediate note. OCR feature will be revamped in Odoo 13. This OCR features helps the end user to scan a record and fetch its data automatically. It also provisions to get it recorded in the system. Suppose if you have a PDF report of the vendor bill that you have received from your vendor, you can just upload the report, the system will get it scanned and record of the pdf in the system making the whole process easier. If you don’t have an accountant beside who knows the Odoo accounting, Odoo helps you in providing a suitable accountant as a substitute for you that will directly work on Odoo 13. Odoo provides the one who knows how to use Odoo. This eventually saves time and money because you won’t have to transfer your accounting data from root to the other accounting software, as everything will be centralized and you encompass someone who knows the system and knows how to use it. Let’s take an example, where you could just post one job ad on a recruitment website in one click and post the add on the website such as monster and indeed for example and you know that we are recruiting a lot of people so I think that our HR department would be really happy. Odoo 13 all the way. It’s likely to see that Odoo 13 will use the possibilities of the Internet of things(IoT) in stock Management. It may come into vicinity that connecting hardware in the rack/shelves in such a way that the hardware will calculate the stock and let you know about the on-hand stock as well as the stock shortage details in real-time. Odoo will add the possibility of tracking the Fleet, stock etc lively so that we can know where the stock/products exactly are. Suppose if we have a big warehouse, by tracking it is easy to know where the product is. So these are the some of the points in the Odoo 13 RoadMap.